Join Carlos Collado, a Forest Therapy Guide certified through the Association of Nature and Forest Therapy Guides and Programs, as he invites you to revitalize yourself with nature's healing powers emphasizing an awareness of self and the senses as we relate to the natural world. Dress for the Season and Comfort - be prepared to be out in the Elements. Come with us Through The Trees and let nature be the healer. Shinrin Yoku - Connecting to Nature Experience is donation-based to support Through The Trees Programs. Carlos is a certified Forest Therapy Guide and 25 year practitioner of the ancient healing and protective arts. 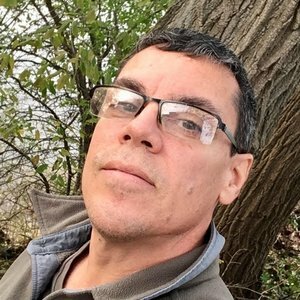 He is a founding member of Through the Trees Transformation Center in Topsham, Maine, where he manages both the Natural Spiritual Warrior and Therapeutic Forest Walks programs. “We share with people how to create sacred boundaries and protect their inner light. The forest holds our classroom and becomes the teacher.” Carlos has long felt and benefited from the effective healing energy and wisdomthat Nature supports us with. This relationship has helped to shape his vision and fuels his passion to create and hold a sacred space where people can learn to connect to the elemental forces. His love of nature and all it has to offer is matched and fueled by his wife and partner, Elizabeth, and his son Marcus.